Hsing Wei has a specialty in PVC shrinkable film printing technology & hence premium customers always prefer our machine. 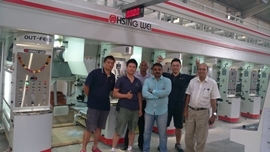 In March 2016, Hsing Wei installed another 8 colors gravure machine in East Africa. Model : 800*8 colors with fully automatic German Siemen PLC system. It is suitable for PVC shrink, PET shrink film, BOPP, CPP, PE, Nylon film. The high performance, auto splicing non-stop with precise tension control for shrink sleeve label. Moreover, Taiyo auto register controller (ARC) with Registration Accuracy Performance. UK Visi Tech web video inspection system to reduce waste and improve print efficiency. It is Reliability over the years. Most important is user friendly & less wastage. Above all aspects will give customers more mileage in terms of productivity. As a new investor, we provide him for gravure shrink industry knowledge. 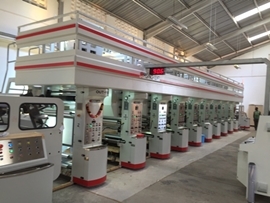 What is trend on heat shrink label industry. Introduce related equipment to customers. We believe that we are really successful when our customers successed.